PHUKET: The Royal Thai Navy is continuing its “search and assist” operation for Rohingya and other migrants arriving in the Andaman Sea north of Phuket, despite its key “floating hospital”, the HTMS Angthong, being recalled to its home port in Chon Buri. Seven warships and search-and-rescue patrol aircraft were initially deployed from the Navy’s Third Area Command at Cape Panwa, on Phuket’s east coast, on May 29. Yet, the HTMS Angthong began its journey back to Chon Buri last Saturday (June 27), Vice-Admiral Sayan Prasongsamrej, Commander of the Royal Thai Navy’s Third Naval Area, told The Phuket News. 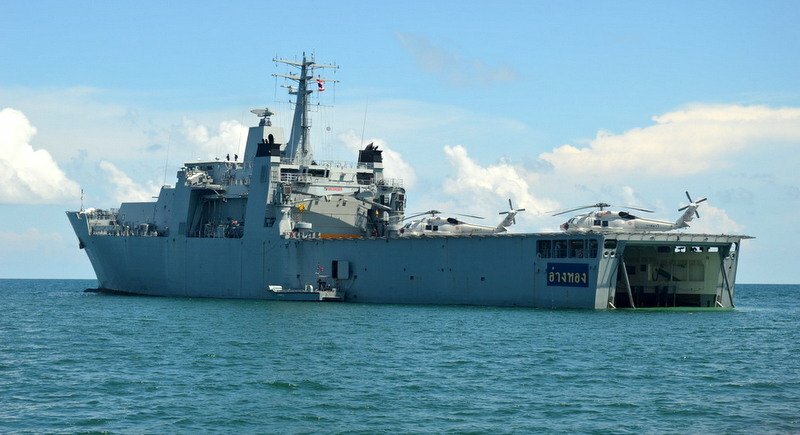 “The HTMS Angthong received its orders to return at 6 pm on June 27 so that it can carry out its next mission from the [Navy] base at Sattahip,” he confirmed. “We have not seen any boats carrying Rohingya or any other migrants since the mission began on May 28,” V/Adm Sayan said.